I picked up promo from a band called Soul Attrition purely based on how much the name sounded like Storm Corrosion, one of the few artists I keep handy in my “socially acceptable” playlist used for road trips and the like. At best, I was hoping for a moody and atmospheric post-metal album. I suppose Vashon Rain counts as moody and atmospheric, but two adjectives can only get one so far in the quality realm. Soul Attrition is the solo project from Chicago’s Josh Parlette of Escape is not Freedom12, and it very much bears that “solo project” mark. From any angle, Vashon Rain is simple; from some it’s homely; from the rest it’s downright uninteresting. The record’s second largest flaw becomes clear just a minute into the first song. Parlette’s singing can barely be called that, and the nicest thing I can say about him is that he seems well aware of his own limitations. His punky, often tuneless delivery rivals Jens Kidman in its lack of range, sounding like an unpracticed Jacob Bannon trying to sing along to OSI3. In “Fatal Flaw,” his saccharine monotone croons bring to mind the soothing menace of old A Perfect Circle records, but when the music calls for a more powerful delivery, as in “Remission” and “Sinking,” he simply can’t deliver. Indeed, Parlette seems to hit the boundaries of his technical comfort zone quickly on all fronts, and his choice to compose within rather than around these limitations ultimately kills Vashon Rain. Every song is slow to mid-paced, relying on not-interesting-enough riffs and deliberate drumming to carry itself. The record often feels metronomic, as the riffs repeat ad nauseam over snare hits on 2 and 4. Such an inoffensive and unadventurous record boils the blood; I sat through forty anodyne minutes of this lethargic post-grunge many times, never improving upon my first impression. Yet Vashon Rain has a few good ideas hidden within it. Though his vocal and guitar performances fall short, Parlette enjoys more success when he decides to focus on his rhythm section. When they’re allowed to, his bass lines find their way through a few unconventional harmonic points – “Unexpected Affront” and “Euclid” both feature the bass as a significant melodic leader at times, but wash so much dreary guitar over it that one can hardly recall any redeeming qulaities. As a closer, “Euclid” ties up the album appropriately; a single interesting riff pops in during the bridge, only to drown below so much goth-grunge pabulum. These sparse moments of passability can’t save the record, but at least prove Parlette’s capability to write a few bars of interesting music. While his pragmatic writing saves the material from over-reaching, one gets the feeling that the entire record should have been left in to cook a while longer. Under-developed and overly-long songs do not a quality LP make, and Vashon Rain finds this project bogged down with both. 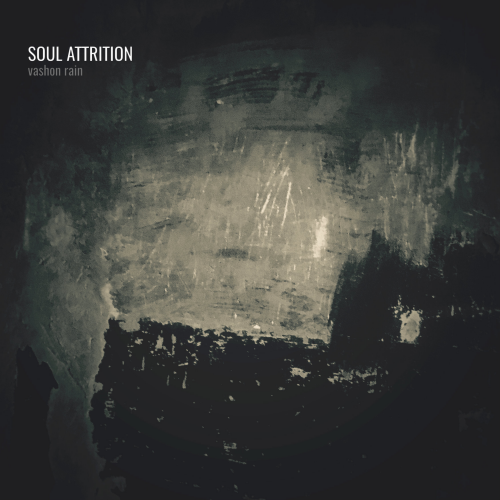 While quality post-metal lies just on the horizon4, Soul Attrition brings nothing of the sort. Vashon Rain‘s underdevolped and dreary post-grunge excites the listener just enough to prepare them for an appendectomy. While I find Parlette’s understanding of his own limits admirable – especially given a few records I’ve heard this year with truly god-awful performances – his decision to release such an underdeveloped project undercuts that respect. A little experimentation and a few laughable failures would have at least made this release entertaining to write about, but such a careful and dreary piece of music denies even that pleasure.